These wingtip devices, which are arrow-shaped surfaces attached to the tip of each wing, enhance the overall efficiency of the aircraft, saving fuel by reducing drag while also lowering noise emissions by improving take-off performance. The modifications will save UPS more than six million gallons of fuel each year and reduce carbon dioxide emissions by more than 62,000 metric tons. 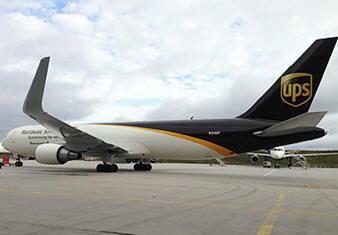 UPS estimates approximately a four percent fuel savings on each 767 flight. UPS continues to lead the industry in sustainable business practices," said David Abney, UPS chief operating officer. "With the widest portfolio of services in the industry, we are constantly looking for ways to reduce emissions, and drive down operating costs so our customers have the solutions they need to compete in a global economy. These winglets are a perfect example of sustainability in action. They are good business and good stewardship." UPS currently operates 54 of the 767 aircraft with five on order. The company plans to have winglets on all 767 aircraft by the end of 2014. Winglets are already installed on UPS's 747, and MD-11 fleets, and the A300-600 has a similar device called a wingtip fence. The modifications will add approximately five and a half feet of span to each wing, and each winglet is 11 feet tall. Aircraft weight will increase by nearly 3,000 pounds due to the weight of the winglets and the extensive structural reinforcement of the wing structure. Even at this size and weight, the winglets will still reduce the amount of fuel used per flight. Winglets improve the aerodynamics of the wing by extending the length of the wing and reducing the amount of drag, which is the force that opposes an aircraft's motion in the air. The winglet project is a sustainability initiative implemented by UPS Airlines. The company already operates one of the cargo sector's youngest and most fuel-efficient air fleet, and is working to reduce its carbon intensity an additional 20 percent by 2020 from a 2005 baseline. Other highlights of the airline's fuel conservation efforts include computer-optimized flight routes, aircraft taxi time management, and alternate-fuel ground support equipment. We believe there is always some way you can improve, and we're applying that spirit to our environmental efforts," said UPS Airlines President Mitch Nichols. "This is a great example of how we can use existing technology to save money, lessen our impact on the environment and serve our customers more efficiently." The Boeing 767 is a mid-size, wide-body twin-engine jet airliner built by Boeing. It was the manufacturer's first wide-body twinjet and its first airliner with a two-crew glass cockpit. The aircraft features two turbofan engines, a conventional tail, and for reduced aerodynamic drag, a supercritical wing design. Designed as a smaller wide-body airliner than preceding aircraft such as the 747, the 767 has a capacity of 181 to 375 persons and a design range of 3,850 to 6,385 nautical miles, depending on variant. Development of the 767 occurred in tandem with a narrow-body twinjet, the 757, resulting in shared design features which allow pilots to obtain a common type rating to operate both aircraft.